We are loving the lighter nights here at Bunches, we have more time to make beautiful creations like this, just for you - let's get baking! 1. Heat your oven to 180C/350F/Gas Mark 4. 2. Line your cake tins with baking parchment – these can be any shape as you will be cutting into them later but aim for a depth of 2-3 inches. 3. Start by creaming the butter and sugar together, this can be done by hand or with an electric whisk if you have one. 4. Beat the eggs into the mixture. 5. Next, sift the flour and fold in – if the mixture is a little too thick you can add a splash of milk. 6. Divide the mixture between your cake tins and gently spread with a spatula or the back of your spoon. 7. Bake for 20-25 minutes, until a skewer can be inserted into the centre of the cake and comes out clean . 8. Allow the cakes to stand for 5 minutes before transferring to a wire rack for cooling. 9. Now time for the buttercream icing – start by beating the butter in a large bowl until soft. 10. Add half the icing sugar and beat until smooth, then repeat this with the other half. 11. Next, add your vanilla extract and a splash of milk and mix until creamy and smooth. 12. Once your cakes have cooled, use a 4-5 inch cookie cutter to create the layers for your mini cakes. 13. Sandwich the layers together with jam and buttercream – we recommend creating 3 tiers. 14. Once you have sandwiched your layers, you can then use the buttercream to cover the mini cakes – for a smooth yet textured effect we recommend using a pallet knife. 15. Time to decorate! 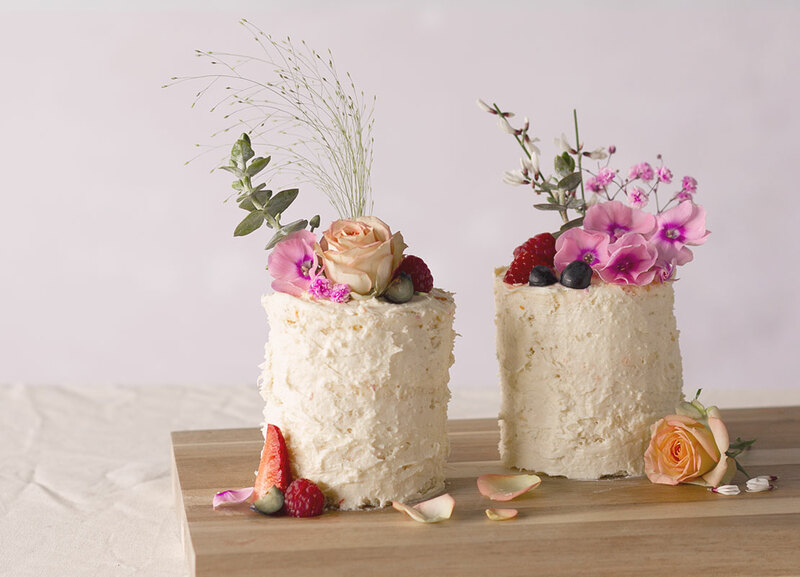 We used flowers and berries – but please make sure any flowers used are edible.